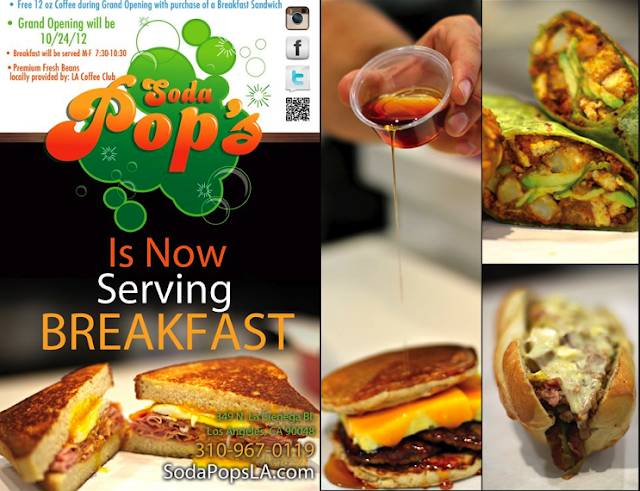 Soda Pop's, East Coast-style purveyors of some of LA's best things between bread come afternoon and nighttime, will begin offering morning sandwiches and full breakfast service officially come next Wednesday, 10/24. Expect the flavor-packed, fresh ingredient, large portion servings the La Cienega spot has become known for. If you simply cannot wait until next week to sample the new menu, you're also in luck: starting tomorrow, 10/18, they soft open and will stay so until the Grand Opening. ALSO SEE: 5 Questions with Soda Pop's Owner, Dave Puopolo. how exciting! i just recently discovered this place and fell in love.